For almost fifty years Corum has offered coin watches, primarily using U.S. $20 double eagle coins that the brand fits with its own manual-wind or automatic movements. This year Corum extends that history with a new coin watch, but with an arty focus and a thin automatic movement. 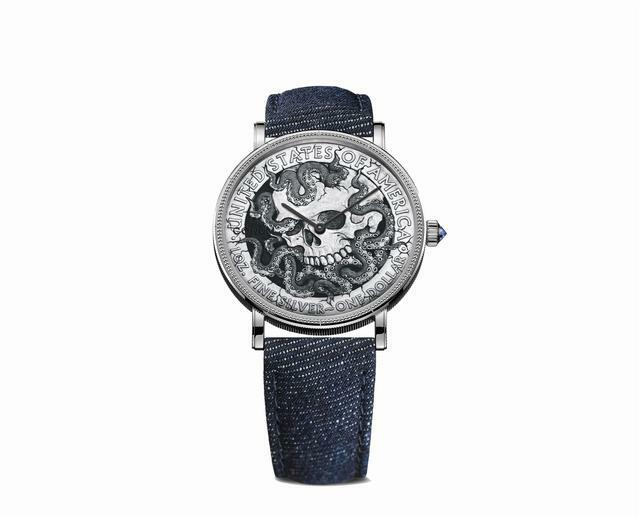 Corum’s new Artisan Coin Watch, the Hobo Coin, transforms an old folk art into a collector piece for the wrist. Artist Aleksey Saburov is working with the Swiss brand to create limited edition coin watches from so-called hobo nickels. These coins were pre-Depression U.S. nickels reworked with engravings by itinerant workers, soldiers bound for the front during World War I or, notably, by penniless ‘hobo’ artists for whom the coins were named. Many were talented engravers, and a favorite coin was the Buffalo nickel, which entered circulation in 1913. The coins today are scarce, though Corum notes that the Original Hobo Nickel Society, founded in 1992, makes it a point to preserve the coins. Saburov, a Russian engraver living in New York, produces artistic 21st-century hobo coins, and Corum is working with him on this small limited series of watches. CASE: Silver, 43m by 7.60 mm, one round blue sapphire, sapphire crystal with anti-reflective treatment, water-resistance to ten meters.